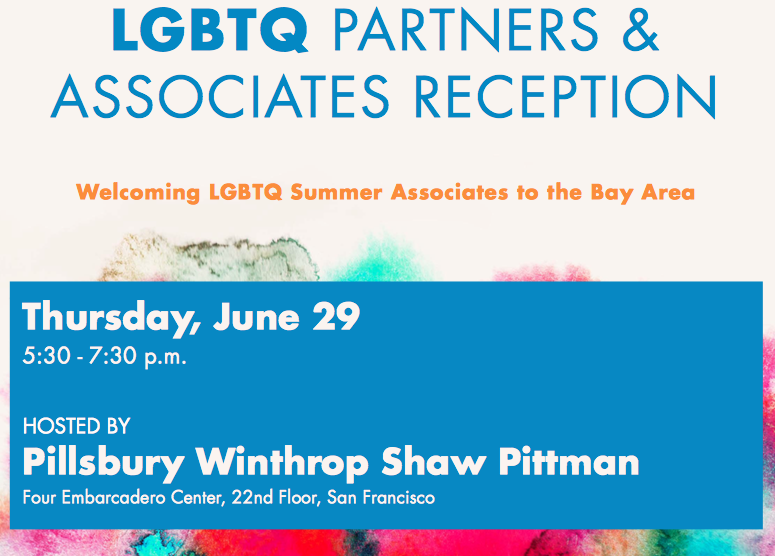 Please join BASF and BALIF at the annual LGBT Partners & Associates Reception! Let us welcome the LGBTQ Summer Associates to the Bay Area! BASF is looking for sponsors of the event. Any lawyer may sponsor with a $100 donation to BASF. The donation goes towards food and drinks for the reception. If you are interested in sponsoring, please email Ann Murphy (amurphy@sfbar.org) and mail a check for $100 to BASF, 301 Battery Street, Third Floor, SF, CA 94111. Please contact Pete Catalanotti (pcc@manningllp.com) with any questions. Big thank you to BASF, Pillsbury, and our sponsors.